Properties of Stainless Steel . . . What Makes Steel Stainless? I promise to use it only to send you "A Cut Above the Rest". Properties of Stainless Steel . . .
A Lot Could Be Said! What are the properties of stainless steel? What is passivation? Why is stainless steel corrosion resistant? What grade of stainless do I need? What is referenced by the "L" series and the "H" series in stainless? What makes a steel stainless anyway? . . . The alloying addition of chromium and nickel to iron creates a significant percentage of atoms at the surface, which form tenacious (good word wouldn't you say) oxides that seal the surface. This prevents oxidation of the iron. The process known as "passivation", through the use of oxidizing acids, change the properties of stainless steel, improving this protective oxide layer. I will now discuss these different properties of stainless steel. Be patient with me! The stainless steel of choice in the food services industry, for example, is the austenitic (higher carbon) 300 series. 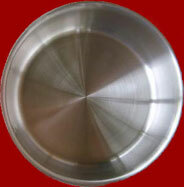 The inexpensive pots and pans are often made of grade 303 alloy stainless which is less weldable. The addition of sulfur makes 303 more machineable, but lowers its corrosion resistance, and is thus quickly attacked by chlorinated cleaners. By the way, Wet Jet Precision's Abrasive Water Jet Cutting machine isn't affected by these "more/less machineable issues. 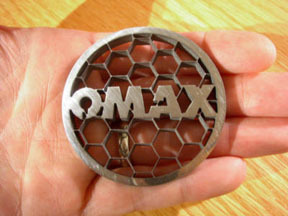 These issues are not relevant with waterjet cutting. 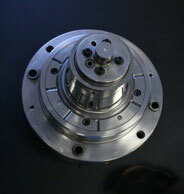 It becomes an issue for milling and other fabrication processes. Typical applications of grade 303 include: nuts and bolts, bushings, shafts, aircraft fittings, electrical switchgear components, gears, and in general any component that is heavily machined and where the corrosion resistance and fabrication properties of 303 are viable. The stainless used for good pots is usually 304 grade. Grade 304 was once referred to as "18/8" because it has 18% chromium and 8% nickel. It can be deeply drawn (stretched) resulting in the best grade for sinks and saucepans. Typical applications of grade 304 include: sinks and backsplashes, saucepans, cutlery and flatware, architectural paneling, sanitary ware and troughs, tubing, brewery, dairy, food and pharmaceutical production equipment, and springs, nuts, bolts and screws. Are you stick'n with me? Grade 316 is the molybdenum-bearing alloy, second in demand to 304 amongst the austenitic stainless steels. The molybdenum gives 316 better overall corrosion resistant properties than grade 304, particularly higher resistance to pitting and crevice corrosion in chloride heavy environments. Typically, chromium depletion of the intergranular boundary causes corrosion. Grade 316L, the low carbon version of 316 is immune from sensitization (grain boundary carbide precipitation). This simply means that its intergranular structure is more ordered, and less random than the more corrosive stainless grades. Grade 316L stainless steel offers higher tensile strength at elevated temperatures. Thus it is extensively used in heavy gauge welded components. Because these steels perform well at elevated temperatures they are used widely for steam pipes and exhaust systems. It is the resistance to elevated temperature oxidation and corrosion that makes alloys 304 and 316 the choice for food preparation equipment, including steam-heated boilers and storage tanks. Typical applications of grade 316 include: food preparation equipment particularly in chloride environments, pharmaceuticals, marine applications, architectural applications, medical implants, including pins, screws and orthopedic implants like total hip and knee replacements, and fasteners. But, wouldn't you know it, there is a trade-off. The metallurgy that makes these alloys corrosion resistant and strong also makes welding them together more difficult than for ordinary steel. The L series of stainless denotes low carbon and is easier to weld. The H series designates a higher carbon content, creating a harder and stronger steel, but one that does not machine or weld very well. Be sure to consider the properties of stainless steel when choosing a grade of stainless for your next project. It could steer you around some big problems, and might even save you a little money! I'll bet you could handle that! By the way, for ongoing tips and information on Water Jet Cutting and related processes, Subscribe to our Newsletter, "A Cut Above the Rest!" Click Here! to Subscribe, top left. To discuss your quote specifications for . . .